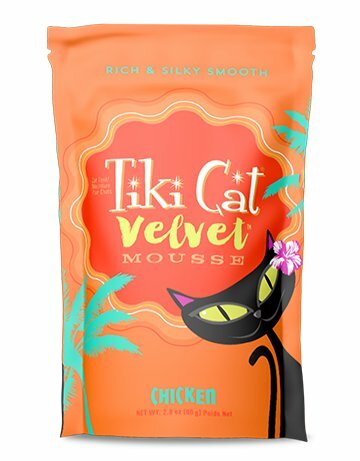 Home » Tiki Velvet Mousse Cat Pouch Chicken 2.8 oz. Tiki Velvet Mousse Cat Pouch Chicken 2.8 oz. Tender chicken, chicken broth and sunflower oil blended into a deliciously creamy mousse. Recommendations vary greatly, based on your cat’s age, activity level and life stage. For adult cats, feed approximately 2-3 cans/pouches per day per 7 lbs. of body weight. For kittens, offer food several times a day, feed up to twice this amount.